Hamilton has a quirky and original approach to wood carving. His curious meerkats painted in colourful clothes look like they’re standing chatting at a cocktail party. There are cheeky baboons and colourful painted elephants, giraffes and cows. Then he has a range of natural wood bunnies with red hearts, and bunny salad spoons. How did you start with wood carving? My father was an artist and taught me his work. I’ve been carving wood for more than twenty years. My pieces are all hand-crafted and I do it all myself. I use jacaranda wood which is light but strong. I got my inspiration from watching National Geographic programmes on TV. When I saw a programme show-casing meerkats I was interested in them, so I decided to carve a few. I got a very positive response from the market that week, so I decided to carry on and developed them further. The elephants I like carving because they are one of Africa’s Big Five and something that most visitors want to see. Tell us about your carved wooden meerkats? The meerkat is my favourite animal to carve. I like them because they always work as a team, they take turns looking out for predators, I like the support they give each other. The idea to paint them with clothes came from some comments from customers at the market. Some of them commented that various of their friends and relatives look a little like the meerkats, especially after one or two drinks! I associated those comments with my meerkat carvings and decided to add clothes to them. It adds character and make them more individual. I try to be unique and innovative. There will always be competition and people that copy. So I’ll keep developing different versions of my meerkats and innovating. 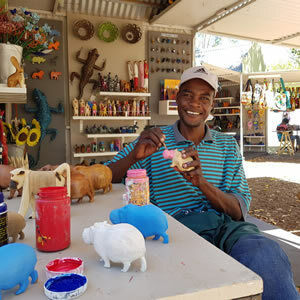 Visit the Craft Market at Spier to see Hamilton’s work for yourself. The market is open every day 10h00 till 17h30 at Spier Wine Farm on the lawn below the Wine Centre.